Whatever your plans are for Valentine's Day tomorrow, I am sure they could be improved by some insanely delicious chocolate truffles. I watched the Barefoot Contessa (one of my absolute faves) make these the other day and have been dreaming of whipping some up since then. It's my favorite kind of thing to make- a fool-proof simple recipe that yields impressive and fancy-seeming results. Whether you're trying to impress your sweetheart, or drowning your loneliness in chocolate (hey, I calls 'em like I sees 'em), these little beauties are sure to do the trick. 1. Chop the chocolates finely with a sharp knife. Place them in a heat-proof mixing bowl. 2. Heat the cream in a small saucepan until it just boils. Turn off the heat and allow the cream to sit for 20 seconds. Pour the cream through a fine-meshed sieve into the bowl with chocolate. With a wire whisk, slowly stir the cream and chocolates together until the chocolate is completely melted. Whisk in the Grand Marnier, if using, coffee, and vanilla. Set aside at room temperature for 1 hour. 3.With 2 teaspoons or a melon-baller, spoon round balls of the chocolate mixture onto a baking sheet lined with parchment paper. Refrigerate for 30 minutes, until firm. 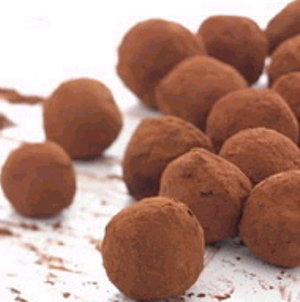 Roll each dollop of chocolate in your hands to roughly make a round ball. Roll in confectioners' sugar, cocoa powder, or both. These will keep refrigerated for weeks, but serve at room temperature. 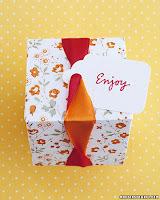 Or pack several of them in a cute box (like this one from Martha) and give some of these sweets to the sweet thing you're sweet on.